Over the Summer, e-ScienceTalk formalised a new relationship with CRISP by signing a Memorandum of Understanding. The acronym, stands for "Cluster of Research Infrastructures for Synergies in Physics". 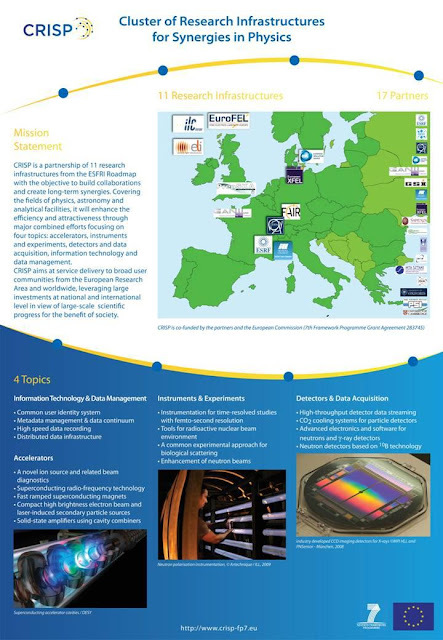 Launched in October 2011, the 3-year CRISP-FP7 funded project is a cooperative large-scale Infrastucture investment (ESFRI), that is bringing together eleven main players/projects from the fields of physics, astronomy, and analytical facilities, across Europe. Working together with CRISP, these collaborating projects will address their communities needs and tackle four key technological areas. These four important areas include [1.] accelerators, [2.] detectors and data acquisition, [3.] instruments and experiments and [4.] IT and data management. The eleven projects include ESRFUP, FAIR, ILL 20/20, SLHC, SPIRAL2, ESS, XFEL, ELI, EuroFEL, ILC-HiGrade, and SKA. Their aim is to enhance the level of co-operation, providing the projects greater opportunities to exchange experience and know-how, thereby accelerate the technologies, as well as developing mutual policies and improvements to key services. Centralising efforts will lead in essence to greater scientific progress within the European Research Area (ERA). The e-ScienceTalk team look forward to reporting on the wide scope of news and technological achievements from the CRISP project as it expands and flourishes! CRISPs next annual meeting takes place in Paul Scherrer Institut in Villigen, Switzerland on 18-20th March 2013.